So today, I had my stem cells collected. Again. After 4 days of high does G-CSF injections, I managed to squeeze out 2.1 million stem cells. This is enough for a transplant. If I’d managed 4 million I could have put some on ice for a possible 2nd transplant at some point in the future. This will do though. In contrast to the previous collection, I didn’t suffer ‘child birth level’ pain, but I did come home feeling pretty ropey. I now wait to see when I’ll be scheduled for their return. For more detail about this process have a look at my previous post on the topic. Some better news. I was in UCLH to have my PICC line (peripherally inserted central catheters) dressed. 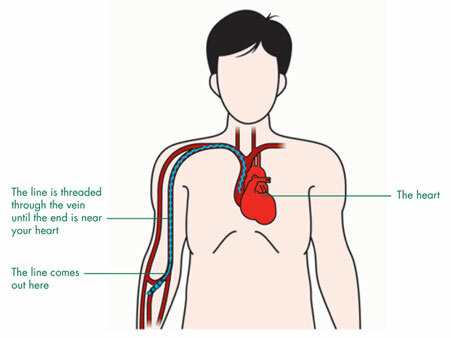 This is a tube that’s inserted into your arm and pushed up your vein into your heart. It’s used to administer drugs and take blood tests. I’ll have it until I my stem cell transplant is finished. Anyhow, I got the analysis of the MRI scan back which was good. Previously I’d had evidence of advancing disease (lesions) in my ribs, a couple of places in my spine, hip and left scapular. 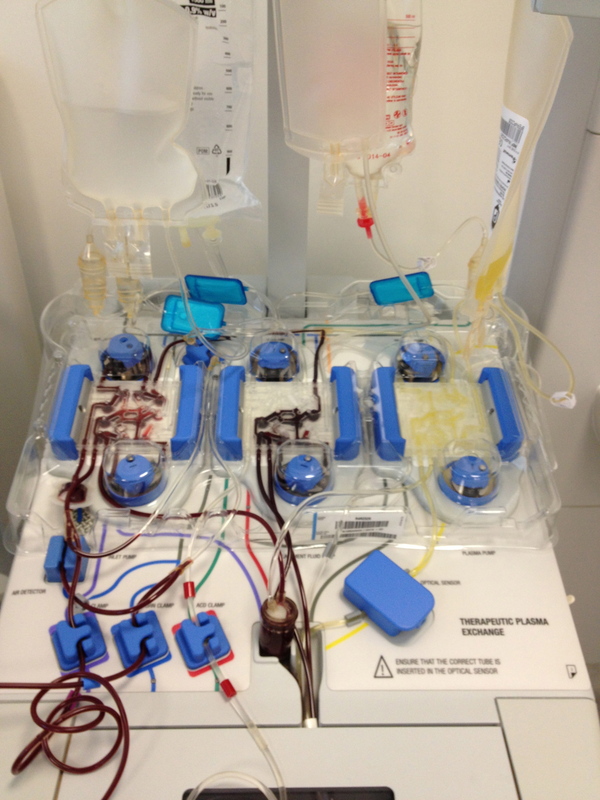 The stem cell transplant will in theory snuff out the remaining disease… for a bit anyhow. The most visible aspect of myeloma disease is its effect on bones throughout the body. In the majority of patients with multiple myeloma, soft spots develop where the bone structure has been damaged. These can extend from the inner bone marrow to the outside surface of the bone. Soft spots appear as “holes” on a standard bone x-ray and are referred to as osteolytic lesions (see figure). These lesions weaken the bone, causing pain and increasing the risk of fractures. The three months of chemo I’d had from January seem to have stopped these developments in there tracks, indicating that the particular form of treatment I had at this time works for me (PAD more here). I was in at UCLH this morning, today was the big day, I would be receiving the stem cells collected back following a high dose of melphalan – another mustard gas derivative that is nasty and evil enough to kill of lots of the remaining myeloma cells. I cant describe to you the psychological import of this, I’d been working toward this point since I was diagnosed in November last year, and the last couple of days had been particularly difficult, anticipation, fear, sleeplessness. I had the usual round of blood tests and waited for the doctor to drop by to sanction the chemo; I was called into a side room and waited. Unusually, the duty doctor was accompanied by the esteemed professor; something was wrong here. So what transpires is this, the lab had used the wrong preservative on the stem cells they’d collected last week. All 8.7 million of them were tainted and I will have to go through the stem cell mobilisation and collection process all over again. For some sense of the horror of this read here, here, here and here. In addition my latest MRI results are ambiguous to my interpretation anyhow and I’ve asked for some analysis back. Some of the lesions appear to have stopped developing but others have appeared. I was discharged from UCLH at 17.00 hours. It was sobering, I received excellent care, but the psychological impact of being in the tower was quite significant. I have an incurable cancer, it’s quite likely that at some point in the future (hopefully many, many years into the future, possibly never), I’ll die here. Leaving the Haemo ward I was stopped by a patient at the lifts who asked if I was off, he was also hooked to a drip on a portable stand and had obviously been off for a toddle about the wards for some exercise. I was I replied. “Do you know anything about stem cell transplants?” he asked, before going on to explain that he had leukaemia, it had relapsed and he was in preparation for a donor transplant. Now all this sounds very innocuous and it’s the kind of routine conversation that you’ll find between any cancer patient anywhere. I replied that I believed that stem cell transplants for leukaemia were to all accounts practically a cure. I should at this stage mention a few odd things about the person I was talking to, I noticed that hovering a few feet away from him was a policeman, he was also accompanied by a lanky friend. There was a strong smell of beer and cigarettes. He spoke quickly and in an overexcited way. My inner urban danger detector went off the scale…. “What’s the matter with you” he asked, I told him I had myeloma and was due a stem cell transplant too. His lanky friend at this point chipped in, “myeloma’s incurable even with a stem cell transplant”, which is true. At this stage my new friend said “oh you’re going to die then”, before turning round and continuing down the corridor. The policeman shook his head and followed after him, with his lanky friend. It wasn’t quite the departure I would have planned for, and in fact totally freaked me out compounding my fragile mood. After a long discussion with my medical team, preceded by multiple blood tests, we decided to proceed with the stem cell collection; a huge relief, as I was also feeling a lot better. The Haemo team think I suffered a strong reaction to the GSCF injections, which would account for nausea and high temperature rather than an infection. This is good, even though the entire process had been extremely unpleasant. UCLH as you’d expect from a university hospital is a campus spread throughout, Gower, University and other streets. What I didn’t realise is that the different centres are connected up by underground tunnels. It’s all terribly symbolic, wheeled into the underworld by the hospital porter we crossed the Acheron (river of woe), Cocytus (river of lamentation), Phlegethon (river of fire), Styx (river of unbreakable oath), and the Lethe (river of forgetfulness)….well not really we passed under University Street and Huntley Street all very interesting nevertheless. On Sunday morning I came round without pain but running a high temperature and feeling very sick. To cut a long story short I was admitted to the haematology unit at UCLH, put in an isolation room, pumped full of antibiotics and put under surveillance. On Monday I was scheduled to have my stem cells collected, a process, which was now under threat. You can’t have your stem cells collected if you’re carrying an infection as you store it with the stem cells (SC); when you get the SCs back, you get the infection back. I sweated (literally and metaphorically) through Sunday and into the early hours of Monday morning, was administered more antibiotics and slept intermittently. The only upside to admission was I got to check out the isolation accommodation that I will soon be inhabiting once they return the SCs. The rooms are really nice, new build, well appointed with great views as you are up in the tower of UCLH. 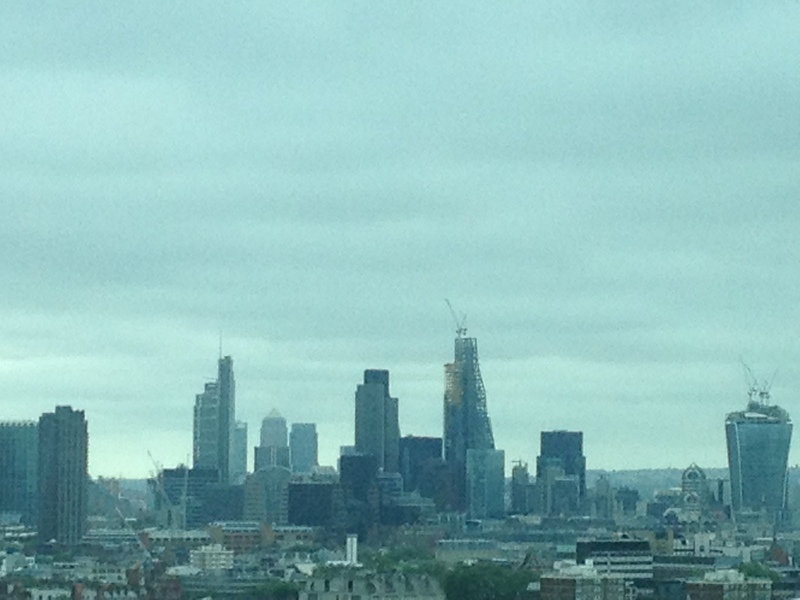 The above picture shows the view toward the city of London. I haven’t updated for nearly a week because it’s been quite a significant one all things considered. I’ll do this retrospectively but by date. Last weekend I had a high-dose of the mustard gas derived Cyclophosphamide, and in the following days a daily injection of G-SCF – a growth factor that stimulates your stem cells and mobilises them outside of your bone marrow to enable collection. By Friday I had successfully self-administered 6 of these stomach-based injections without drama of any sort. I had been briefed by the CNS (clinical, nurse, specialist) at the Mac (Macmillan Cancer Centre) to expect ‘giving birth levels of pain’ by day 7 as the stem cells were forced out of the bone marrow. In my minds eye, I imagined a collective fist-pump from womankind. Saturday came, and so did the pain as waves of pulsating agony radiating from my lower back. I resorted to codeine, hot water bottles and Hail Marys. I survived but it was quite excruciating. I also realised at this point that my discomfort and control indexes were totally inadequate to capture the levels of pain I experienced. I might have to invent a new one. Anyhow here’s the data from Saturday.